A Tavola Magazine is a Food & Wine magazine. It is published yearly 12 times in a Italian. Buy a single copy or subscription to A Tavola magazine. A Tavola is a magazine devoted to the world of kitchen and home. You can follow step=by-step instructions from the biggest international chefs who will help you on your way to preparing restaurant-quality dishes worthy of a five-star rating.Each issue offers tips and suggestions afford the reader the ability to produce unique meals and then learn how to select the best wines to accompany your creations. If you want to improve your cooking skill, then it’s worth picking up this truly an amazing food magazine. 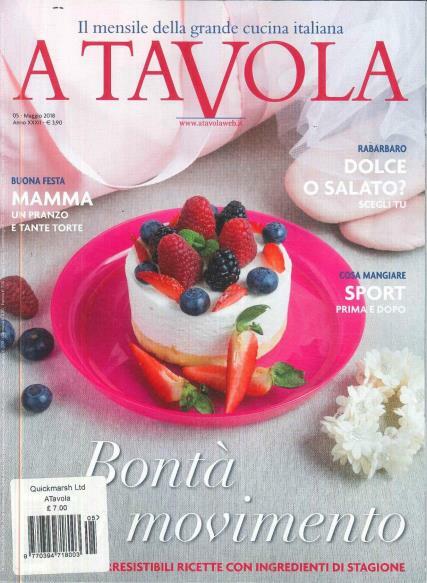 A Tavola is the magazine dedicated to all those who appreciate good food and love to cook.